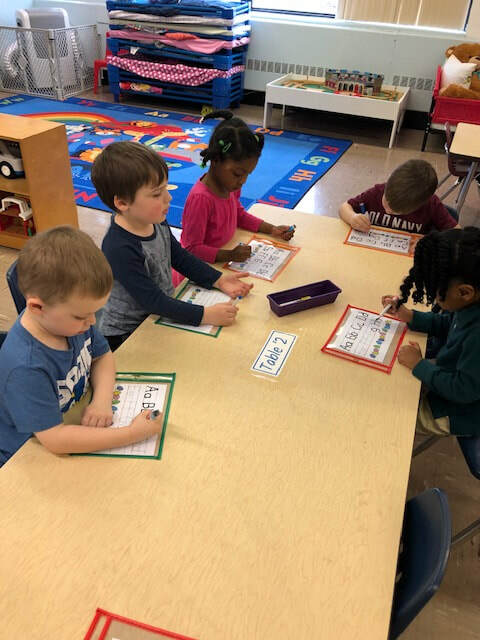 Welcome to Our Pre-K Page! 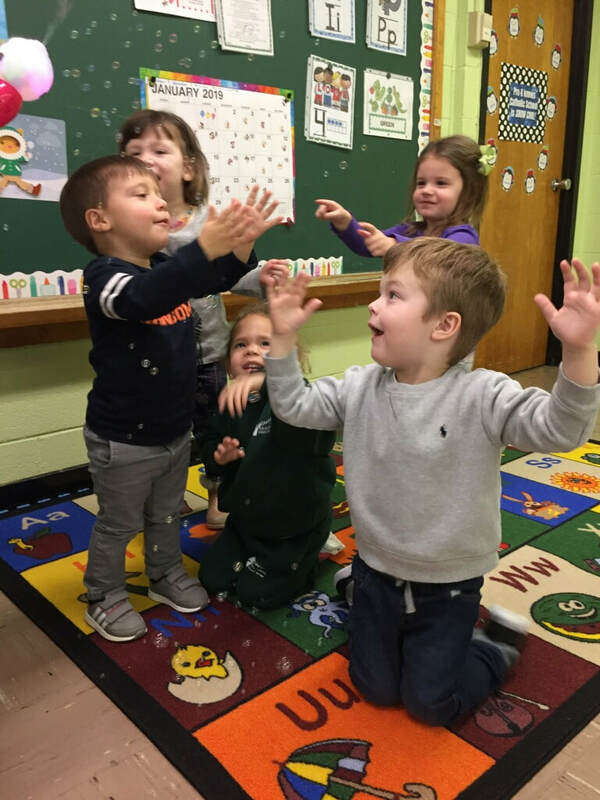 Welcome to the Pre-K A & B class page! on our class STREAM projects, and will talk about how April showers bring us May flowers. 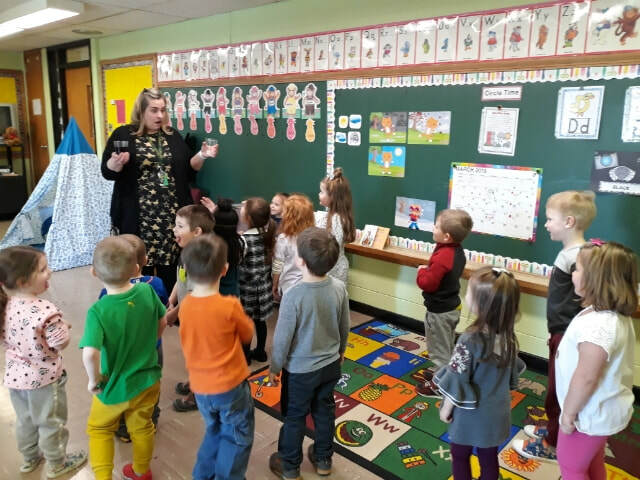 Pre-K movin' and groovin' with Mrs. Cicalese! Pete the Cat isn't the only one with magic glasses! 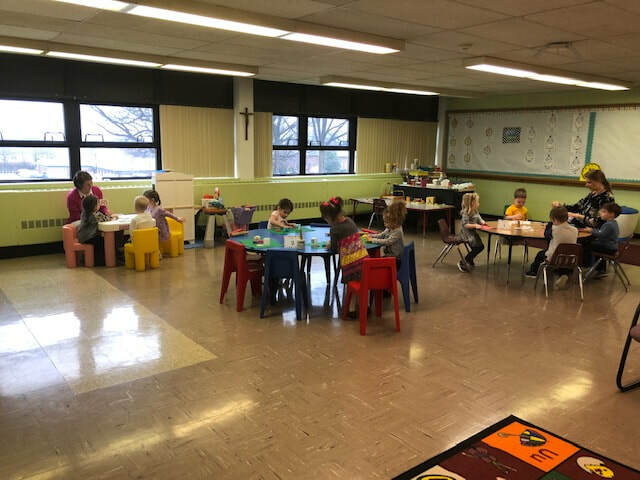 Hard at work in our centers. The results are in, and it was a close race! 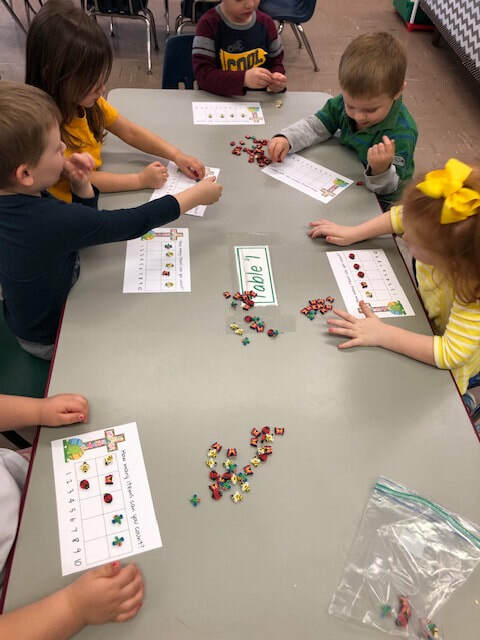 Pre-K's favorite apple is.... a tie between red and yellow-- and green was only one vote behind! This was a big surprise, as we did a vote last week, and nearly all of the students said their favorite would be red. ​We tried red delicious, granny smith and golden delicious apples . 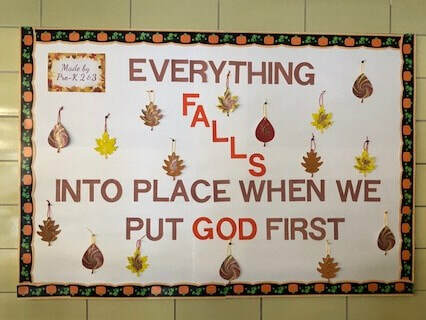 We have been working hard to get the classroom decorated for Fall. 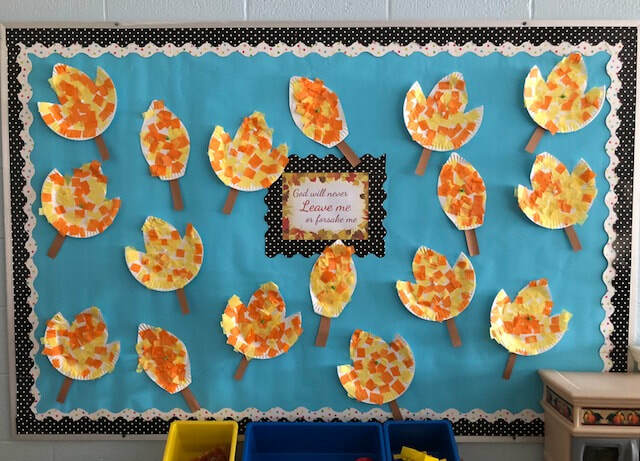 ​We are learning about leaves this week, and made these colorful leaf collages for our bulletin board! 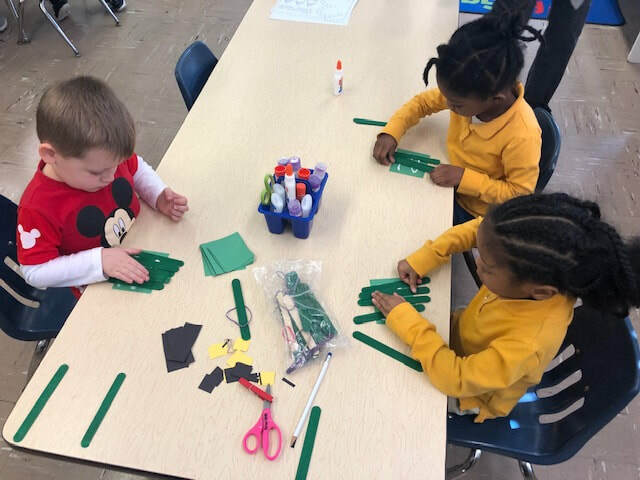 ​Today we practiced counting to 10 and made trees with 10 leaves to decorate our hallway. Then we sampled some home-made apple sauce! ​with some apple crisp and ice cream-- yum! ​Please be sure to stop by the cafeteria to see our "magic rainbow leaves" on display! ​Another tree-mendous Math project is now decorating our halls-- triangle trees! Thank you so much to all of the Grandparents you made it in to celebrate today. It meant so much to our class! 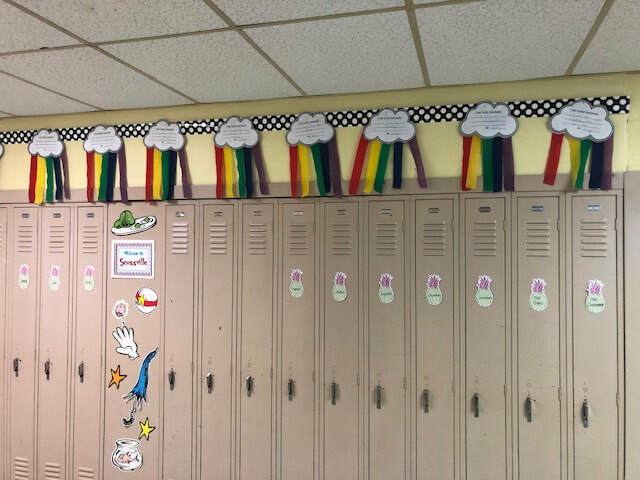 In case you didn't get to see it, here is the awesome bulletin board Mrs. Caprio made to showcase our magic rainbow leaves. The children are very proud to have their work on display! ​by to tell us all about fire safety and being a firefighter. He also showed us his uniform and told us all about it! 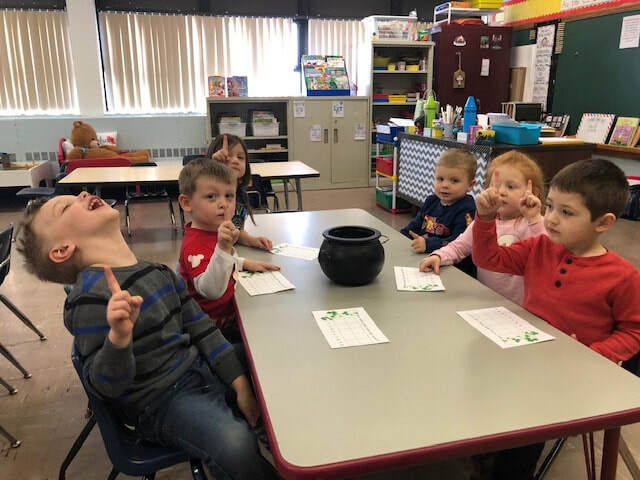 The class loved reading The Five Little Pumpkins and we played a fun counting game before making our "thumbkins." 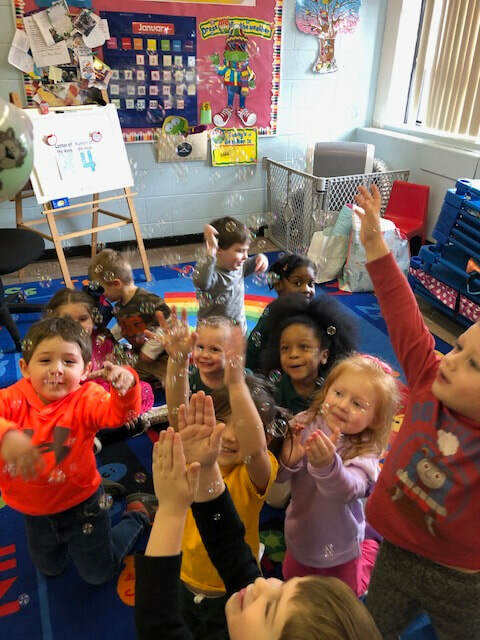 What a day to be in pre-k! We counted pumpkins, made magic mirrors and finished up our thumbkins project. ​Plus, we had another special visitor--this time on the playground-- a box turtle!! Yesterday the class read Put Me in the Zoo and made Spot the leopard. ​Today we went to the pumpkin patch during Math, and then made some pentagon pumpkins with 5 seeds! We worked on our pasta pumpkins today! Preliminary voting has revealed that we are big fans of pumpkin donuts! 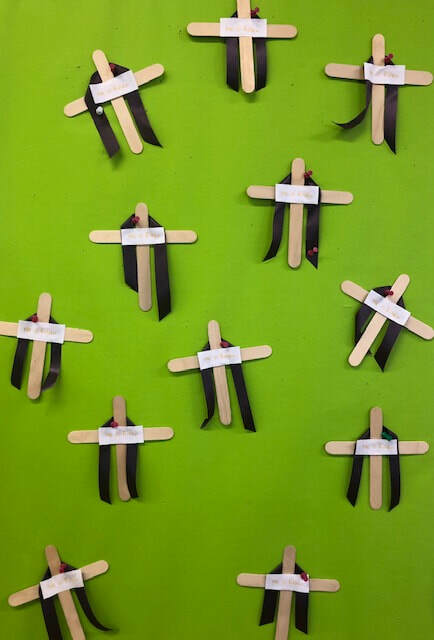 We also had fun creating our 'paper dolls' today and learning about Baptism. It was a landslide victory for pumpkin donuts (over pumpkin pie and pumpkin bread). We finally had our in-school field trip, and the Barlieb Family helped bring the pumpkin patch to SSPJ. Thank you to all our room parents for a fantastic morning. We finished the day with the some watercolor painting and a good nap! We started our unit on bats today, and made these awesome scratch-art rainbow bats. ​They are currently hanging up in our cafeteria, helping to make it extra spooky. Stop by to see them on Friday night during Trunk or Treat! ​Wow! What a busy week! We visited the Book Fair and Mrs. Quigley was nice enough to read us a few stories after our 7th grade buddies helped us make our Wish Lists. We also had fun making book marks and spooky bats. Next week will be even creepier, when we learn about spiders! Eek! Creepy, crawly, shape spiders! When we say "Halloween," you say Party!" Our classroom is covered in spider webs! But don't be alarmed-- they are really pretty cute. We started working on our "Grateful Tree" today and also made some cool squirrels. 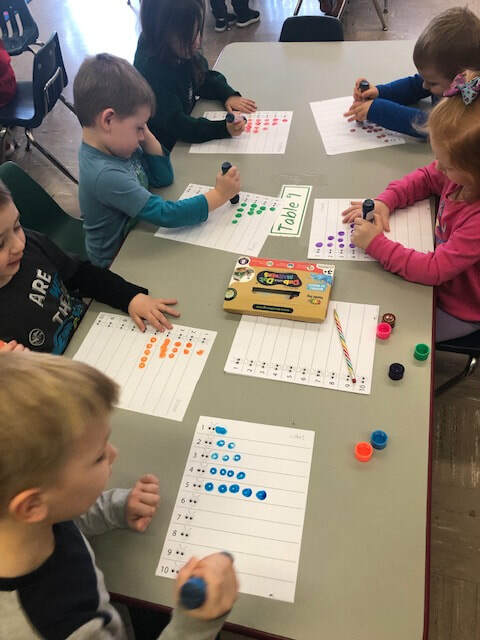 Today we practiced our fine motor skills and played a math game with the sneaky, snacky squirrel. Squirrels love to eat acorns (and some students seemed pretty interested in these also)! We are decorating for the Thanksgiving season and learning about healthy eating. 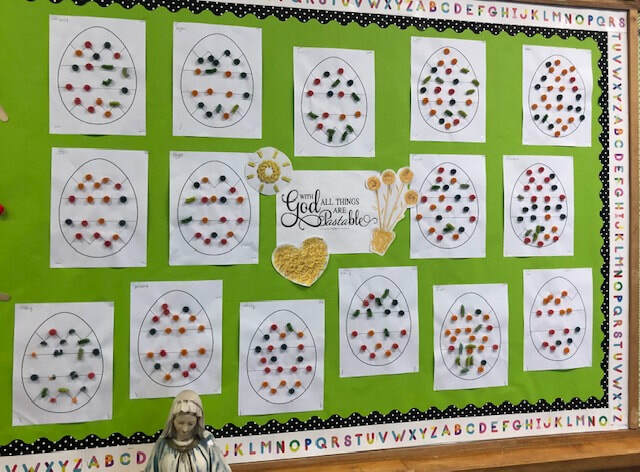 These students are very serious about fruits and vegetables. Look how hard they are working! We are so blessed to have such a wonderful class, and we have so much to be grateful for. I miss these little angels so much. I'm so glad they had a great time celebrating Mickey Mouse this week, and I love the beautiful sign they made me! 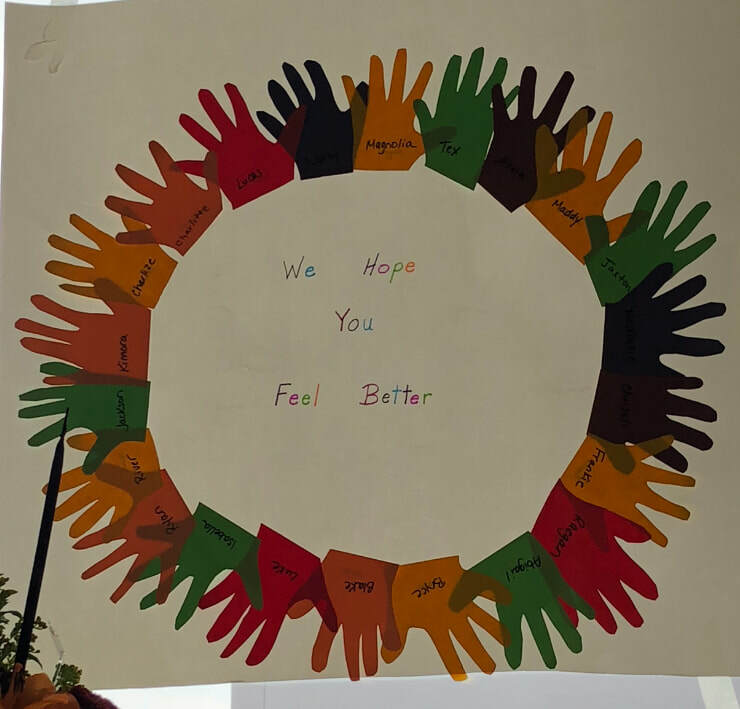 ​Thank you to all of the Pre-K families for their kindness and and support. We are all so proud of the fabulous job our students did on stage, celebrating the true meaning of Christmas-- Bravo, Pre-K! 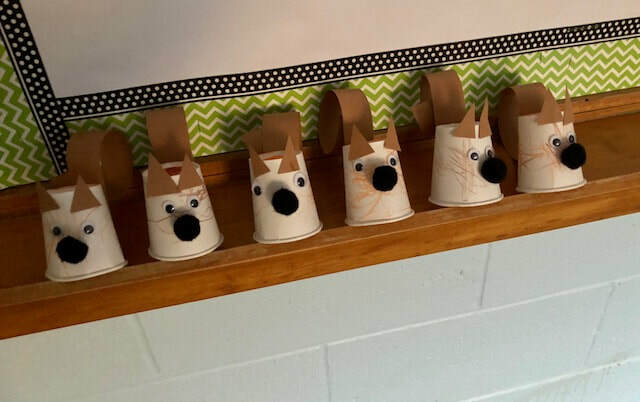 Check out some of the amazing holiday themed projects the class made. 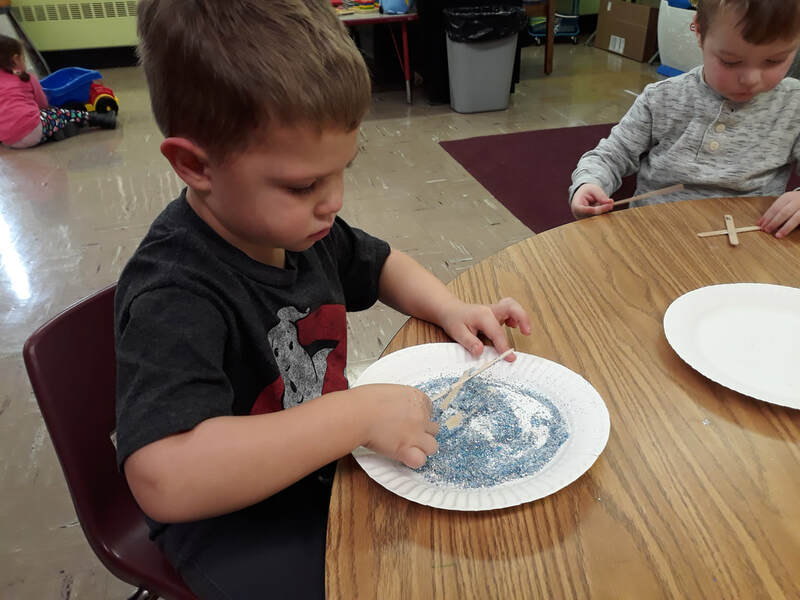 Here's a sneak peek at the snowflakes which are decorating our pasta art bulletin board this month. S is for snowflake (and sparkling)! With a lot of science and a little bit of magic we made snowflakes and learned about color mixing. 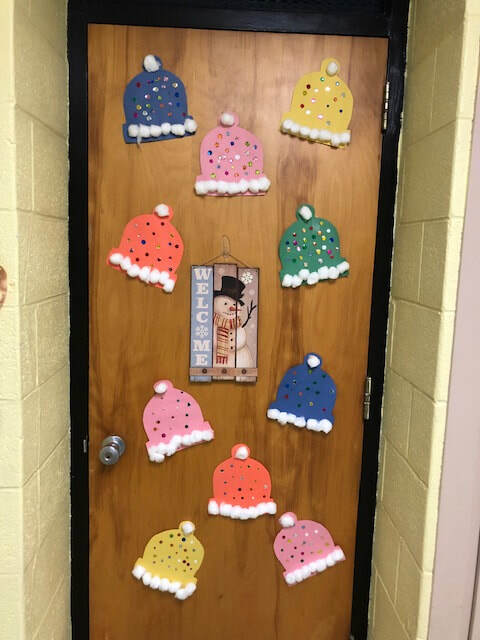 We love to come in everyday and see our "Big, Medium, Small" Snowmen hanging in our hallway. Intently working on painting our warm Winter mittens in ziploc bags. Look at how beautifully they came out! Our pom pom jar was filled this week, which means we were great listeners. You know what that means-- DANCE PARTY!!! Our "Do Now" this morning was free drawing on big paper with colored pencils. We worked very hard on our warm winter hats. The sequins were a huge hit! Check out the finished project! 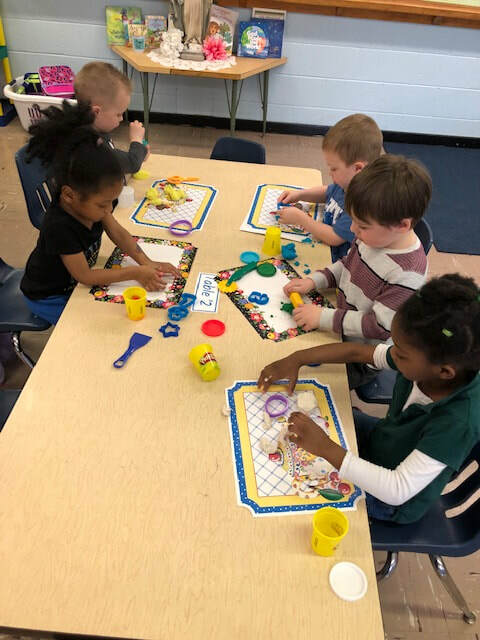 We worked very hard in our math, craft & play doh centers today. We also made decorations for the sweetheart dance, but NO SPOILERS! 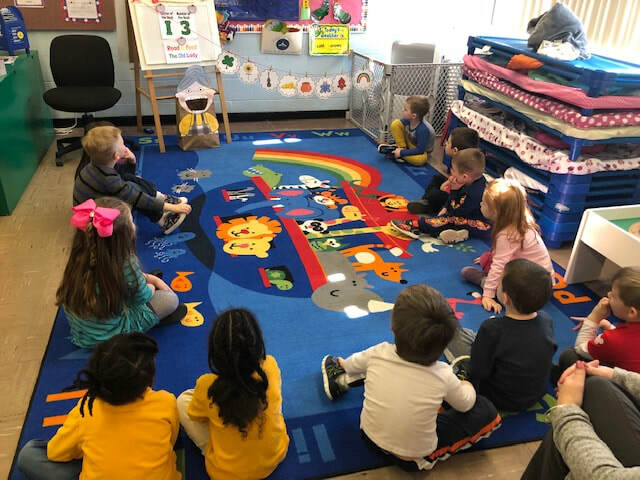 Mrs. Siano read us a HILARIOUS story last week! We learned all about Dr. Martin Luther King, Jr. today, talked about our hopes and dreams and made K is for King artwork! Working hard in our 'hot cocoa' math centers! 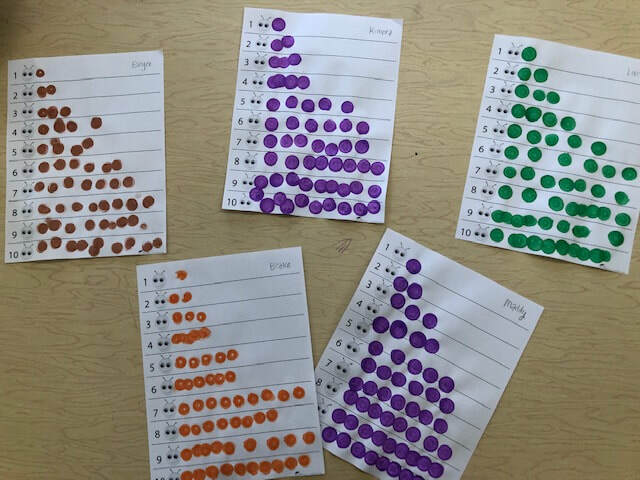 You can COUNT on our class to do a great job learning about numbers! ​This week we constructed the number 4 out of popsicle sticks and put 4 "marshmallows" in our mugs! 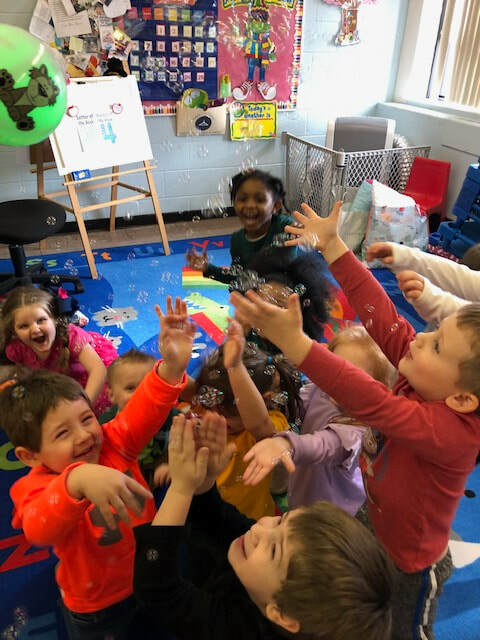 We didn't get enough snow this week, so we changed the weather report to sunny with a chance of bubbles! ​We also did an awesome job in our centers. 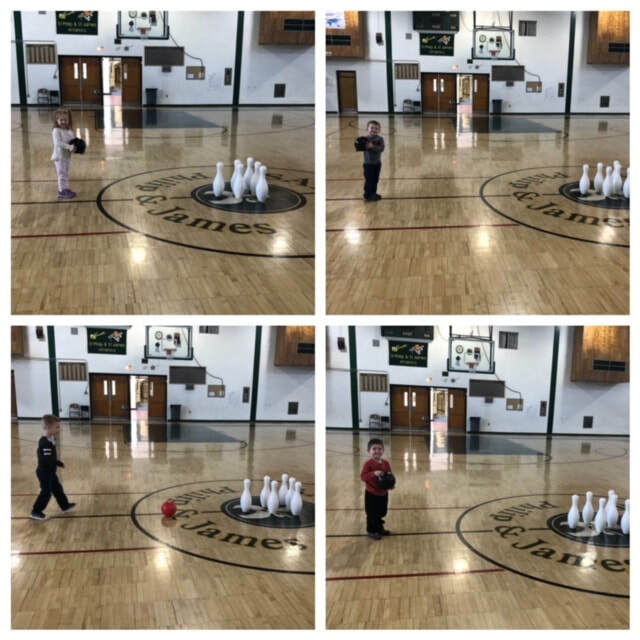 We kicked off Catholic Schools Week with a special project. ​We made working lanterns, because Catholic Schools Light the Way! STREAM project with our buddies from 7th grade. They performed skits for us today, and we LOVED it. 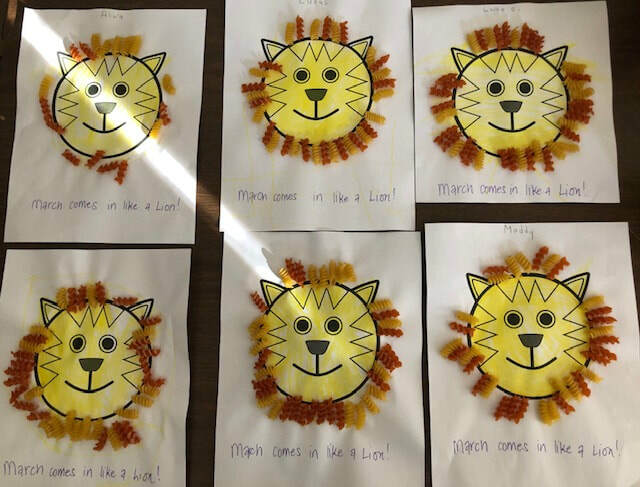 Pre-K wanted to let Mrs. Mancini know how much the students of SSPJ school appreciate her, so we have created a SWEET surprise! We have had enough snow this week, so we took down our snowflakes and made some penguins! Pre-K loves crazy hat day! We learned all about germs today! We wanted to see some germs so we are doing a cool science experiment with slices of bread. Just for fun, we made some of our own germs by using water colors and blow painting. We REALLY liked this! ​We also made a special card for Deacon Rob. Please continue to keep him in your prayers. 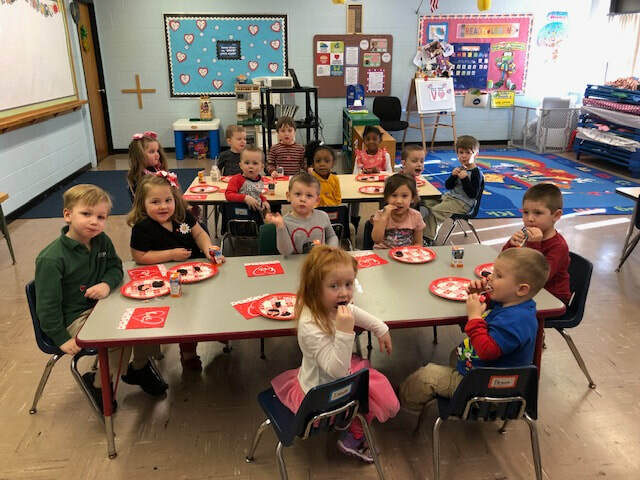 Happy Valentine's Day from Pre-K! We had lots of Abe Lincolns and George Washingtons show up to celebrate Presidents' Day! We worked so hard making letters in our math and literacy centers, and creating "Spilt Milk" art that we needed a play break!! We learned all about dental health today and made some clean, happy teeth! 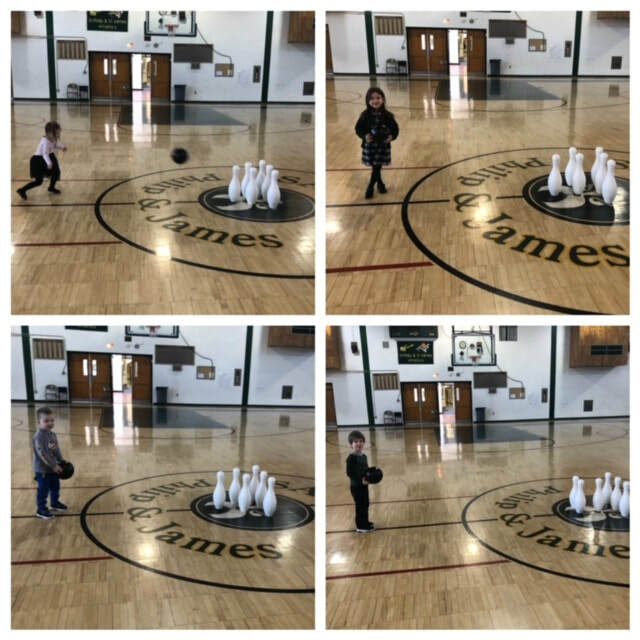 Pre-K couldn't let the "big kids" have all the fun, so we took a break and did some bowling at the SSPJ Lanes today! Seuss Centers! Dr. Seuss number tracing and constructing our cats in hats. Our pom pom jar was full just in time to have a birthday party for Dr. Seuss!! The Cat in the Hat?! Pre-K knows A LOT about THAT!!!! 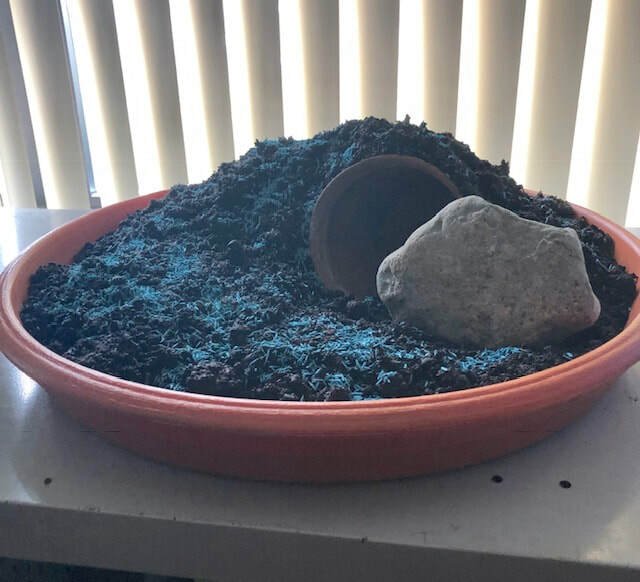 Check it out-- our science project worked. The germy bread has grown mold, and the bread touched with clean hands is still fine! 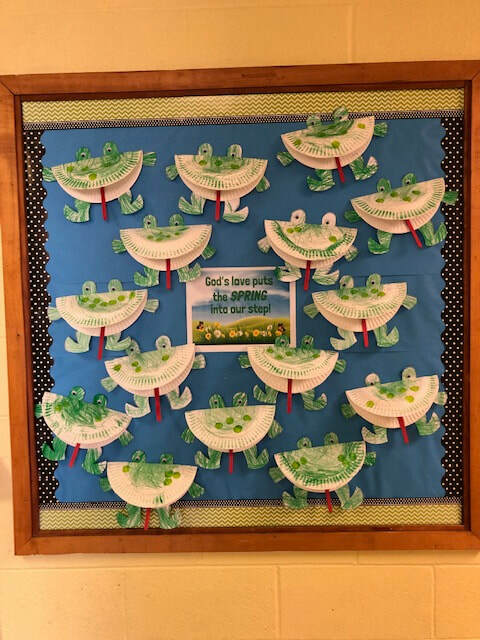 This March, Pre-K is feeling lucky for all of the blessings in their lives. Our "Luck Tree" will be on display all month. Some friends with their ashes after Mass. 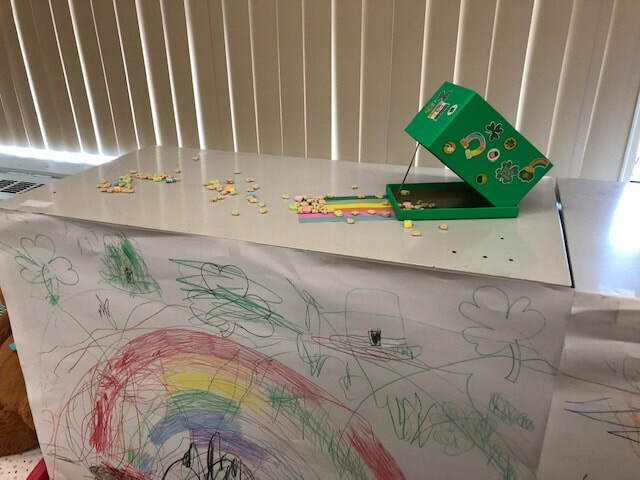 St. Patrick's Day Centers & Activities! 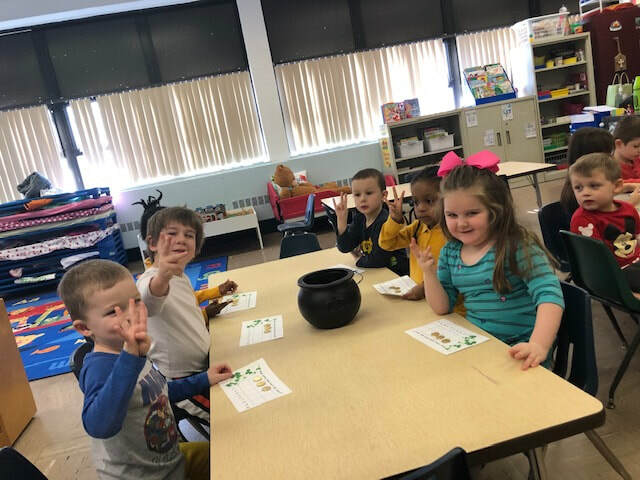 We made leprechaun hats, stamped the number of the week (3), counted leprechaun gold, and fed the Old Lady who swallowed a clover! We also made pasta shamrocks and talked about The Blessed Trinity. ​We have been sham-rockin' out! 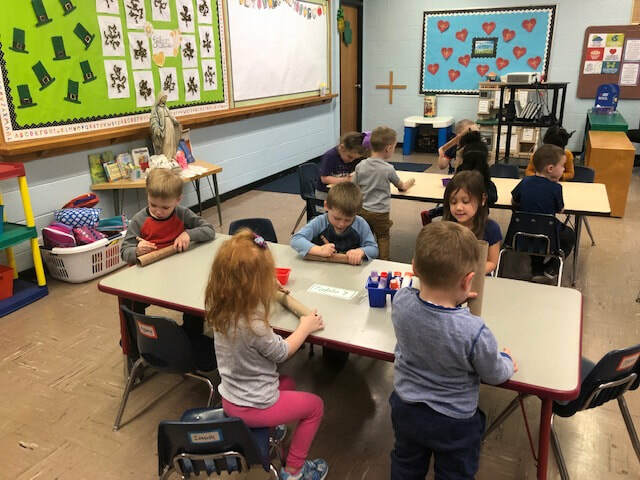 We made shamrocks out of hearts and labeled the 3 parts of The Blessed Trinity. We also worked on some fine motor skills with tissue paper balls. We finally had to throw out the germy bread. We kept the clean slice, and are prepared for a long wait! 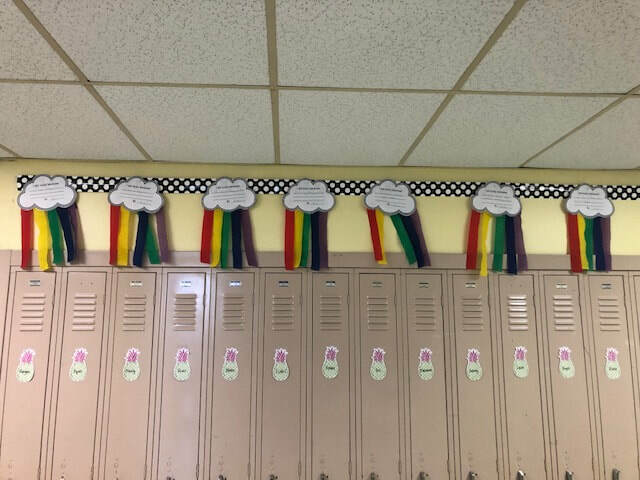 We decorated with beautiful clouds and rainbows, and thought some more about how lucky we all are. He was here! We didn't catch him this year, but he loved the lucky charms so he left each one of us a gold coin! We are finishing up our unit on Miracles and today we talked about Jesus' First Miracle, when he turned water into wine at the Wedding Feast at Cana at the behest of Mary. We can't make miracles but we did a trick, and turned water into "wine" ourselves! 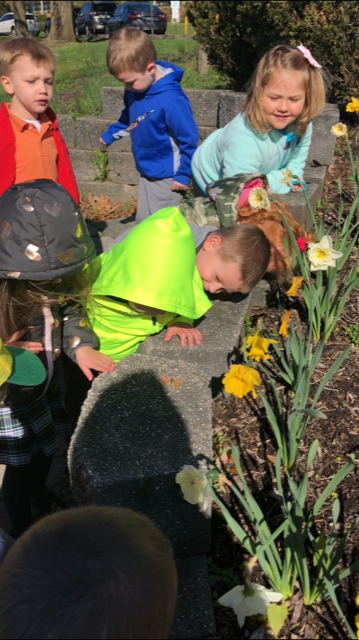 We hopped into Spring this week! 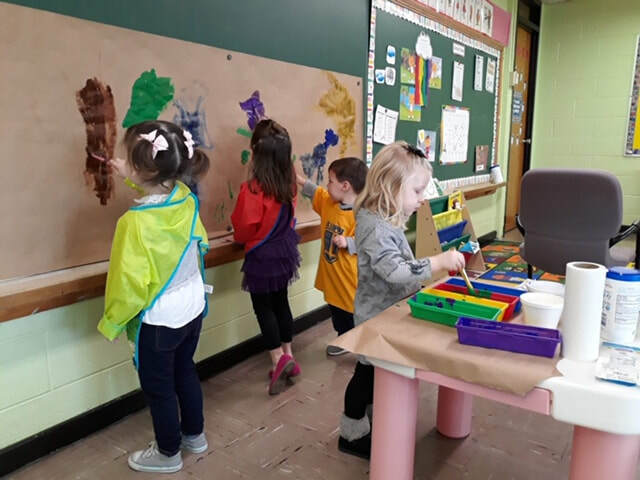 Pre K A working in centers, painting, and singing about the 5 Green, Speckled Frogs! Hungry caterpillars are loose in our room! Hopefully these hungry frogs will scare them off. 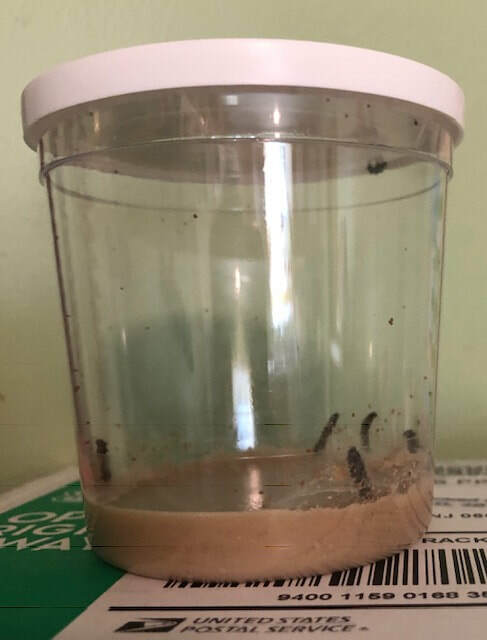 Our caterpillars arrive today! We are very excited to start our butterfly garden tomorrow. These little guys will be flying home soon! 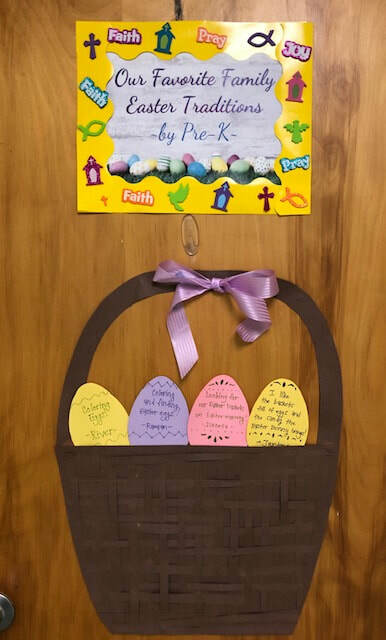 We love hearing about everyone's favorite family Easter traditions! If you haven't already, please send in a note for your child to share with his or her class during morning meeting. We are using the traditions to decorate our hallway! 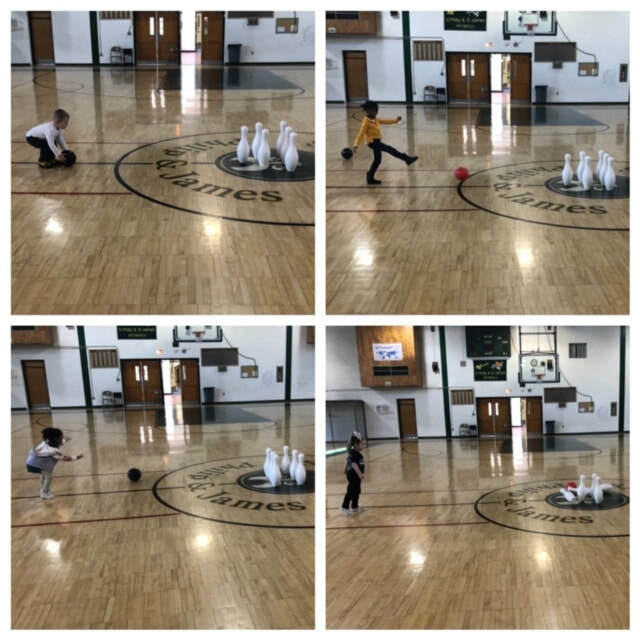 The Pre-K B students worked very hard on their STREAM projects today. They may be hard to see, but here are our chrysalides! There are 6 total and we will be transferring them to their new home on Monday. 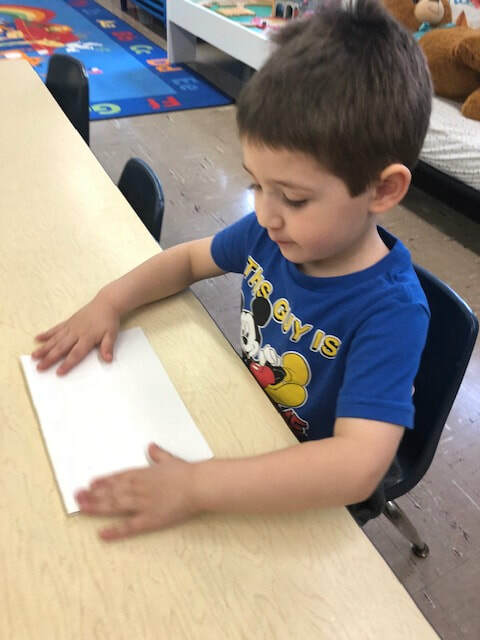 In our centers today we counted "insects" on our Easter ten frames and practiced making letters A-H on our dry erase mats. Our chrystalides were moved to their new home on Monday. We will have butterflies any day now! 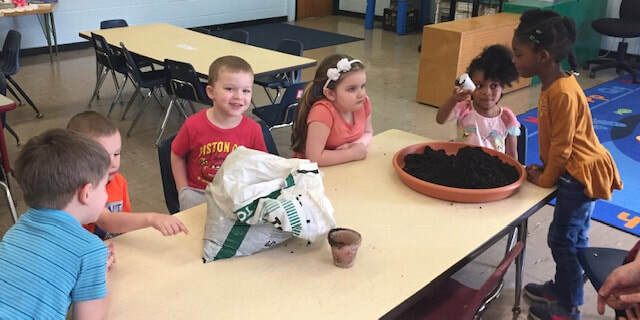 Pre-K A started their STREAM project today. 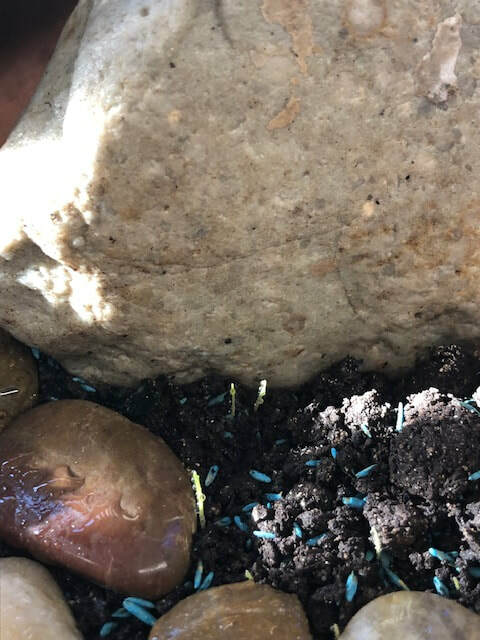 They are planting a resurrection garden. 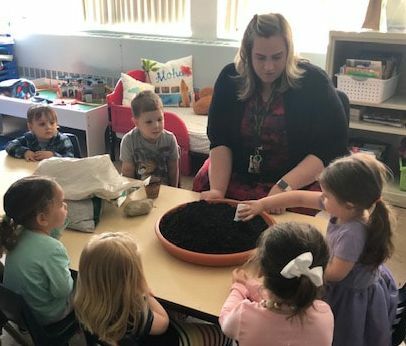 Pre-K B wanted to get in on the action too-- we all loved getting our hands in the dirt! We can't wait to add the finishing touches tomorrow, and the grass will start to grow soon, we hope! The students finished setting up the garden today. 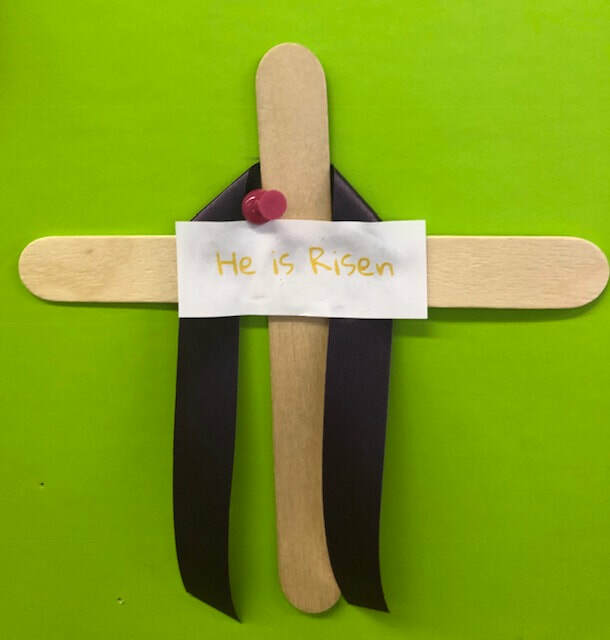 Every child placed a stone in the path leading to the tomb, we added the 3 crosses, and we will take turns watering the garden each day. 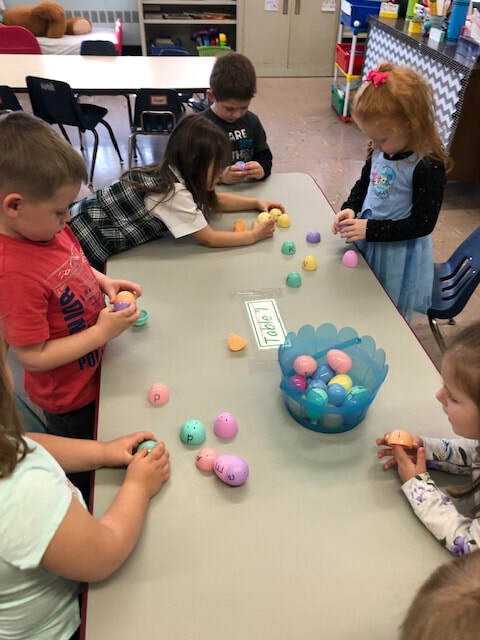 We also had fun matching letters in our Easter Egg literacy center! Today we painted rainbow Easter eggs. The children loved 'smushing' the paint. 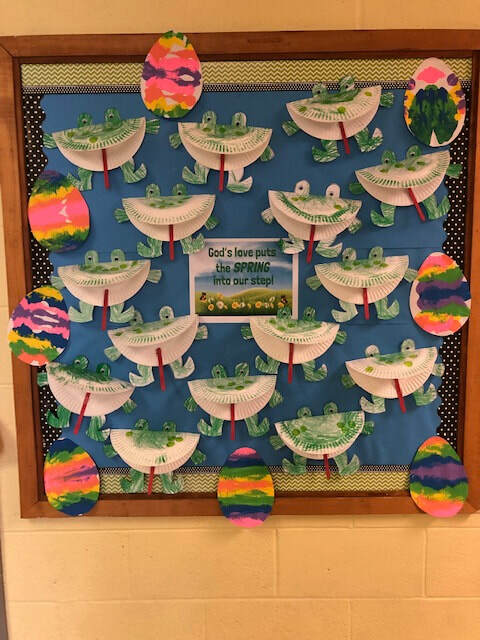 We hung them up with our frogs to jazz up the hallway! Today something amazing happened! We came in and saw that we could see wings forming beneath the chrysalides. ​We returned after specials to see a butterfly had emerged! 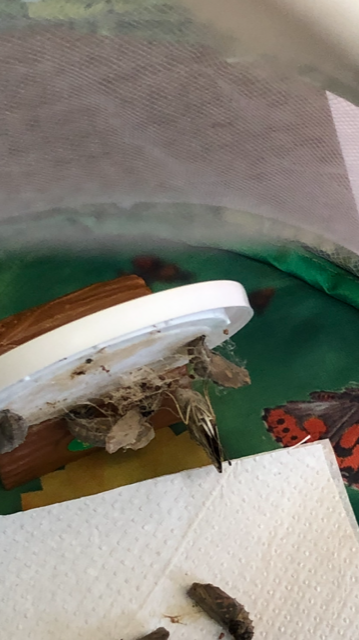 We invited Kindergarten to come in an show us their Butterfly Life-Cycle dance, and as this was happening another butterfly hatched out of its chrysalis, right in front of our eyes! 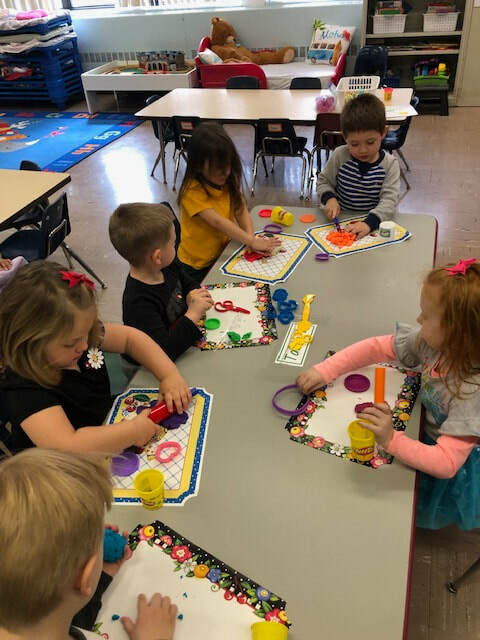 For fine motor Friday we had Easter play doh centers were we used egg cookie cutters and numbers, of course! 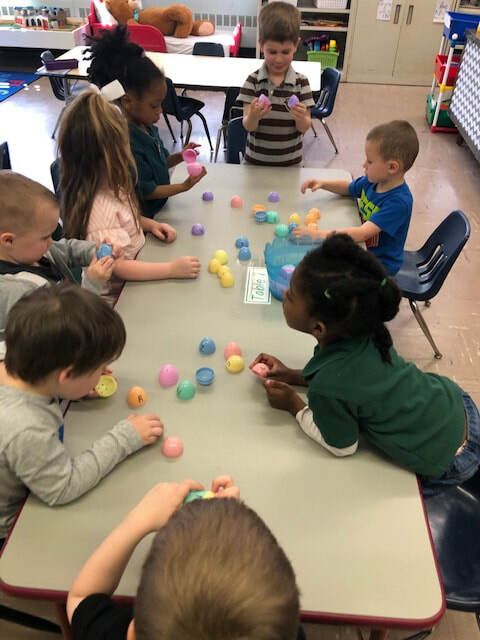 We counted how many eggs we could make. One student made 9 identical eggs! 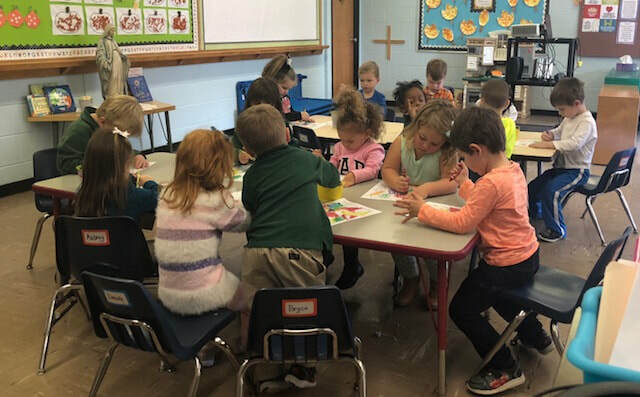 ​Another exciting day in Pre-K. The butterflies are so active and fascinating to watch. We fed them some pineapple (thanks Mrs. Korp!) and even got to see a few using their long proboscis to enjoy the sweet fruit juice. We also had the first shoots of grass appear this morning! The children love watering our garden each day. 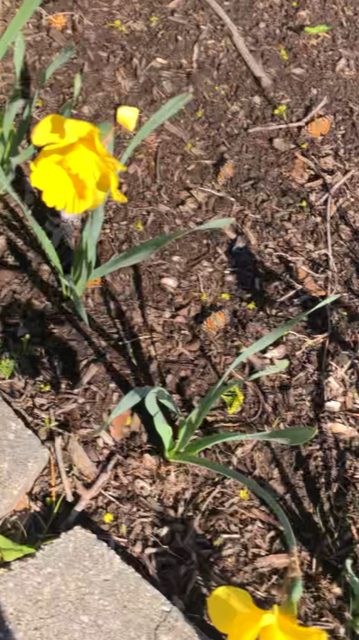 ​go amidst all the beautiful spring flowers.